First thing I always do is put a coat of clear gesso on the surface. The paper from 13@rts had a beautiful texture and I wanted to add to it so I used a wood veneer stencil from my stash with paste. Then I added some Pink spray also from my stash and added a little water. 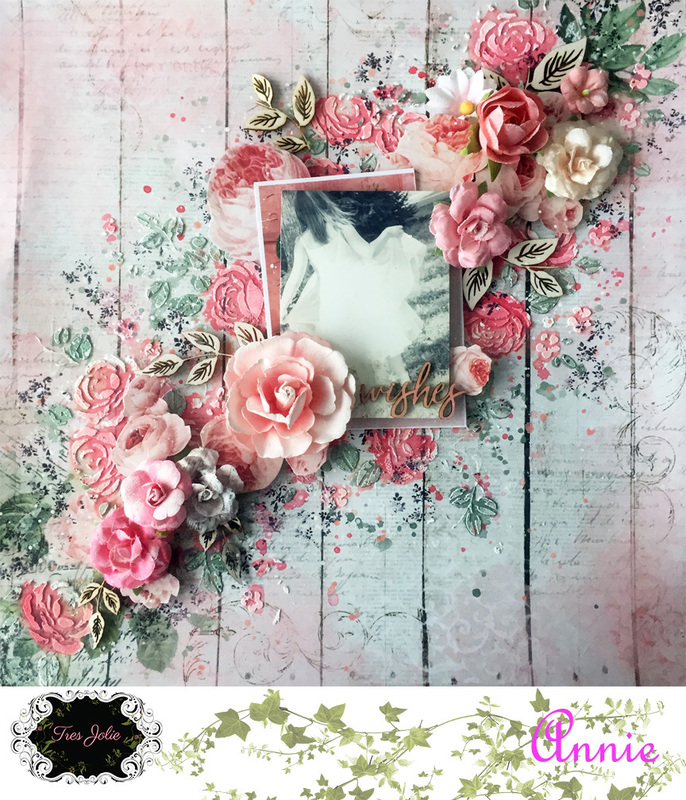 I used a paper from the Prima Misty Rose collection and cut out some die-cuts and a frame included in a Prima flower pack also. Finished off with lace and flowers and a wood title from 13@arts. Hello everyone ! 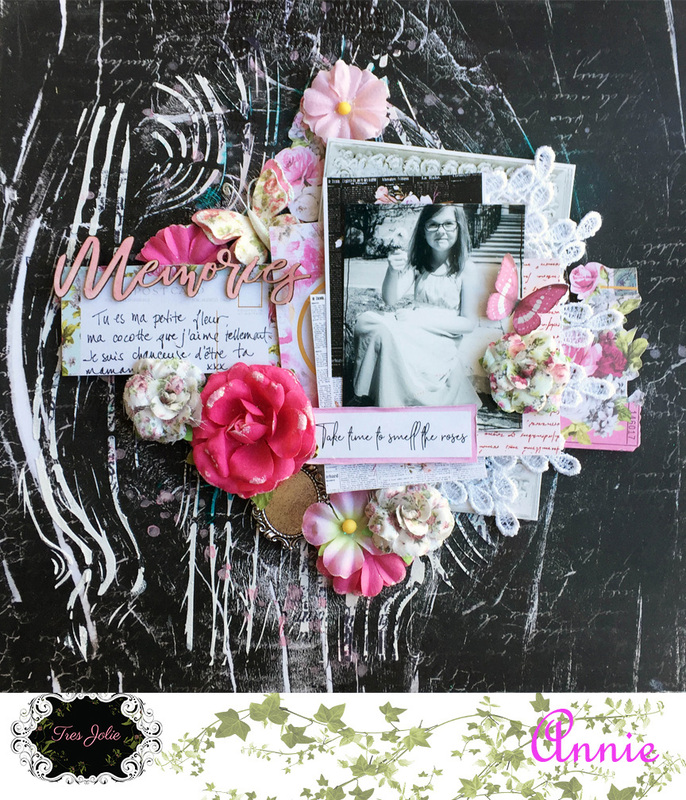 We have a beautiful sketch this month and I am presenting a layout I made inspired by it. First thing I did is applying clear Gesso on the surface because I knew I would be using lots of mediums. Once everything was dry I used a stencil from my stash and put on both sides. I used a lot of 13@rts Turquoise Mist on all the surface and also some Pink from my stash. I cut out some peaces from “Their word for each other” Prima paper and the frame from the Prima flower pack to put under and around the photo. I finished with flowers, wood peaces and title from 13@arts. I used a photo of dh and I on our anniversary this year. Man where did the past 24 yrs go? How about some close ups? I started with a 2 sheets of the Prima paper. I cut the busier sheet and layered it on the light pink sheet of paper. I distressed the edges of the paper and did some light stenciling on the background. I used the large trim piece and heat embossed it with lindy’s caesar’s gold embossing powder. I also layered paper and that cardboard from from the flower pack under my photo. I popped the layers up with foam tape. 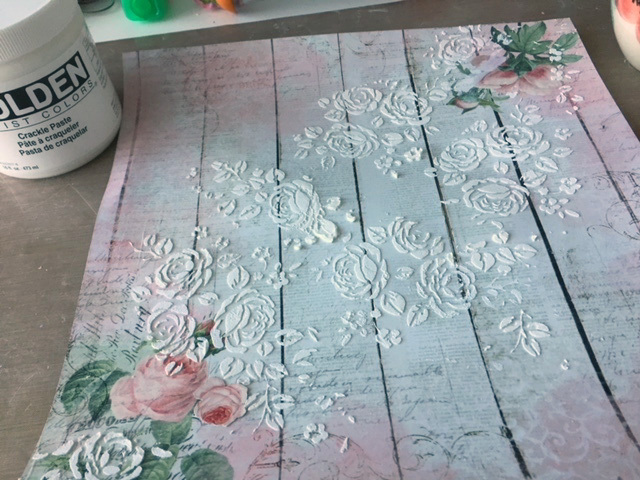 I used some of the lace as a border and did a small cluster of the flowers. The title is from the 12×12 chipboard. I heat embossed that with the Lindy’s as well. I also added a small floral cluster in the bottom left hand corner. Here is my little tip for the week: I have found that Lindy’s Caesar’s Gold embossing powder is a great match for this kit. If you have it in your stash try it out. Hello all !! 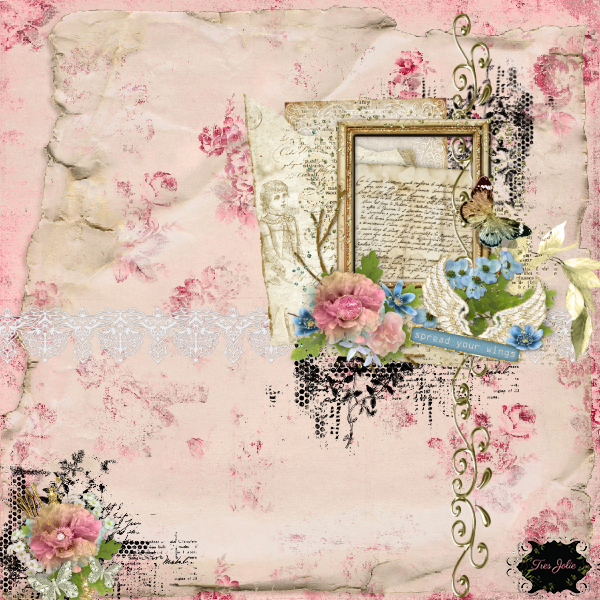 Today I am sharing with you a layout made with October’s Scrapbook Kit. 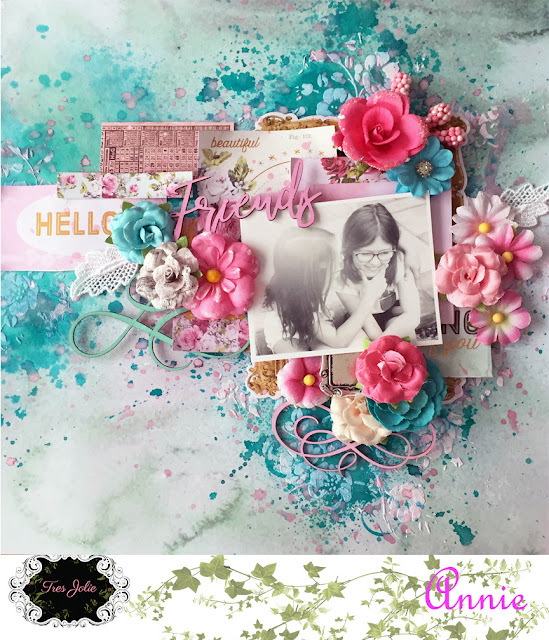 This month’s kit is filled with gorgeous papers from Prima and 13@rts. I started of course by a coat of Clear Gesso on the surface to prepare my paper for mediums. As you can see on the photo I used a stencil from my stash with crackle paint. 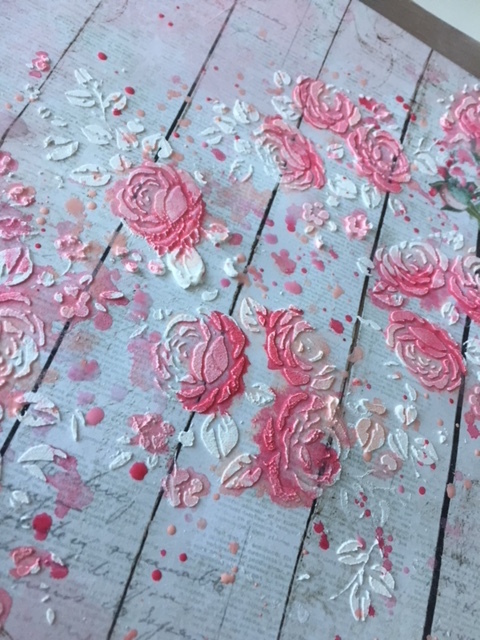 Once the flowers were dry I used Watercolors in different Pink shades. I did the same thing with Green on the leaves. 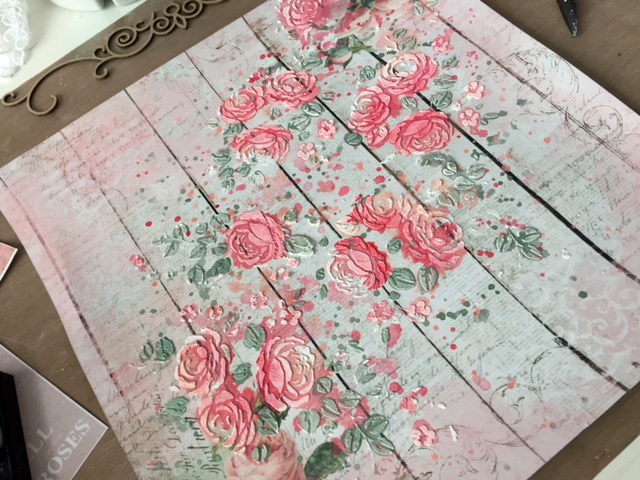 I wanted the roses to blend with the flowers that are already on the paper. 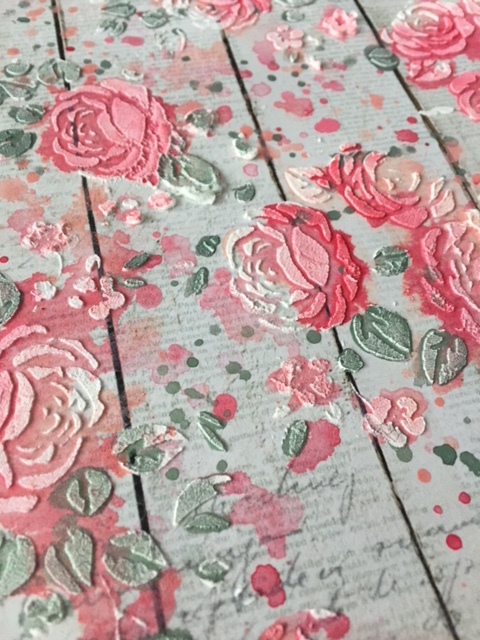 I also took a flower stamp from my stash with Black ink to add texture. 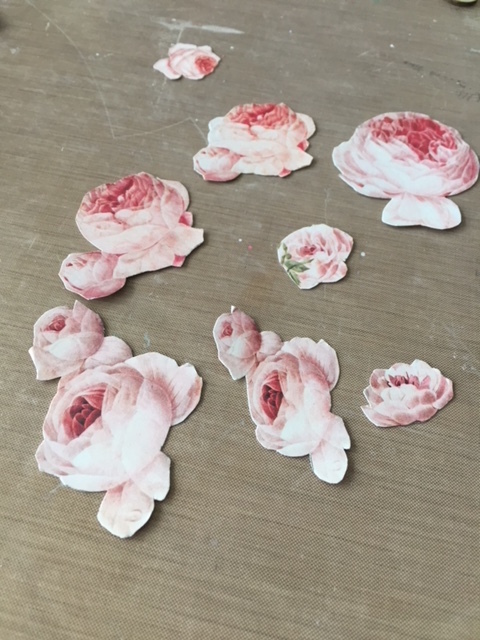 At last, I cut some flowers from the other papers from the kit to use them as Ephemeras on the layout.